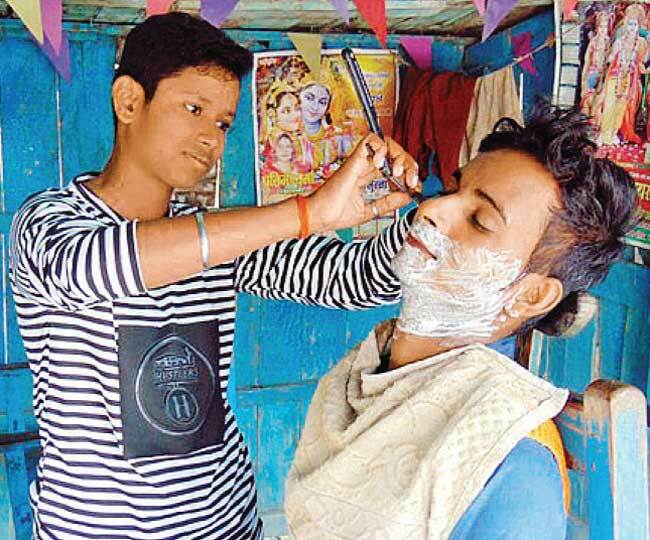 Two teenage sisters in India were recently honoured for their grit and determination after it was discovered that they disguised themselves as boys for four years in order to keep their father’s barbershop open after he became ill.
Jyoti Kumari, 18, and her 16-year-old sister, Neha, from Banwari Tola, in India’s Uttar Pradesh state, took over their father’s barbershop in 2014 after he suffered a severe paralytic attack that left him bedridden. The girls were only 13 and 11-years-old at the time, but the barbershop was the family’s only source of income, so they had to do something to put food on the table. At first, the barbershop was closed, but as the family savings evaporated, Jyoti and Neha reopened it and started running it themselves. But things didn’t go well at first, as some men were skeptical about having girls shave their beards and trim their moustaches, while others treated them badly. So they started disguising themselves as men. The teenage girls cut their hair short, started wearing stainless steel bracelets normally worn by men, and changed their names to Deepak and Raju. Most of the people in their village knew their real identities, but men from surrounding communities had no idea they were really girls. The disguises allowed the girls to keep the barbershop running and earn about 400 rupees per day, enough to provide for their family, pay for their father’s treatment and continue their studies. Some of the people in the village kept mocking them for posing as men, but the two sisters ignored them and focused on their work, as they had no other choice. They managed to conceal their gender and real identities for four years, but as time went by, they became more confident and recently started revealing their secret to more people. After a journalist from the nearby city of Gorakhpur published their incredible story in a Hindi newspaper last week, Jyoti and Neha earned the praise of an entire nation and were even honoured by local authorities for their grit and determination in the face of adversity.